Mahjong Royal Towers is rated 2.8 out of 5 by 20. 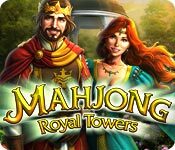 Rated 5 out of 5 by Lyndy20 from Delightful Mahjong game With World Contest, a unique type of Mahjong game came along, continued in Spooky Mahjong, Christmas Mahjong and now Mahjong Royal Towers. I will never tire of this type of game where goals need to be achieved. There are 3 goals in each level and these vary. You do not need to achieve all 3 goals to progress, just 1. You can return to a previous level to improve your score, should you need extra stars/points to move on to the next group of levels. Some reviewers have mentioned that this game is timed. You will, sometimes, have a goal that is timed, but this is not true for all levels. This game can be easy to play, or you can challenge yourself to achieve all 3 goals. With so many levels, it will keep you occupied for a long time. Rated 4 out of 5 by hobo11 from Like getting trophies! Have to admit I like to get the 3 stars and don't mind working at it. However this game I have to say was really tough to achieve the 3 stars on all of them. I did... but I had to spend hours and hours on some of them to understand their logic as to how to remove the tiles within the time frame allowed. My favorites are the World Contest Mahjong games. Love the games that you earn trophies. This one ( for me ) was definitely a challenge!! Rated 4 out of 5 by Sante001 from Challenging Mahjong Game I don't usually play Mahjong games because I get bored with them pretty quickly. However, I also like trying games that I tend not to play to see if it will interest me. That be said, here is my feedback. The basic rules of the game are that you remove matching "free" tiles during play and try to complete 3 goals for each level. For example, goals might be to complete the game in a particular number of moves, remove all the gold tiles, and earn a certain amount of money. If you do not complete all the goal, you can replay the level. You can earn bonuses along the way. You can also highlight tiles that can be removed.After the first level, the levels get progressively my challenging. If you enjoy Mahjong games, you may really enjoy this one. While I like this game a lot, I'm not sure that I purchase since I still found it boring after playing for 40 minutes. 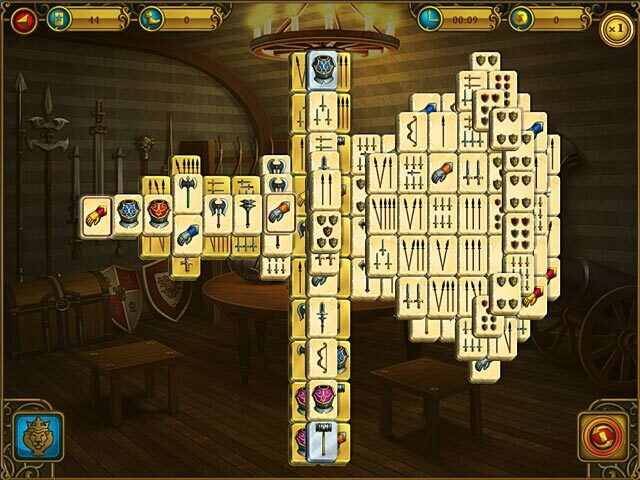 Rated 4 out of 5 by chiari_survivor from Medieval or Castle theme: Beautiful graphics, nice music, 8 tile choices Mahjong Royal Towers 512 MB RAM, 48 MB Hard drive 6 player slots Options: includes sliders for music/sounds, check boxes for full screen & cursor. 8 tile options represented by a red dot, #1, head armor, sun/moon, flower, cooked turkey, sword, & a kings crown. 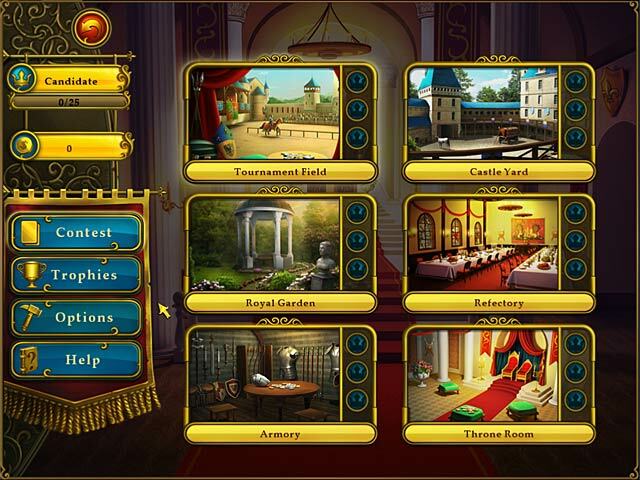 Credits: Producer- Roman Artyukhin; Art Producer- Daria Edokova 12 Trophies- One for completing each of the 6 fields (Tournament Field, Royal Garden, Armory, Castle Yard, Refectory also called a dining rm, & Throne Rm) which are all shown in the center picture on the game page, then 6 other trophies for over 100,000 pts, 25 crowns, removing 1000 pairs, using bonus 50 times, achieving X5 index, & completing 30 levels w/ highest score. Main screen has Choose player, Play & Exit Each of the 6 fields has 20 boards =120 total. Once you complete a board the next will unlock & light up. Once you complete all 20 in the Tournament Field, the next field will unlock. Each of the field pictures is the back ground while playing the 20 boards for that field. Each board can earn 3 stars. 1st- for matching the number of gold tiles listed, 2nd- accomplishing in the set number of moves & 3rd- completing it in the set amt of time. You can not turn off the timer but the game allows you to take as long as you need, you just will not get that final star. As long as you get at least 1 star you will advance. Would still be better if the timer could be turned off totally according to each players preference. The music is a calm relaxing instrumental piece w/o sounding like a lullaby or can be turned off. All tiles are medieval/ castle themed. Graphics are beautiful,they were sharp & clear with very detailed pictures. I played games w/ several tile sets. A few were so detailed, that it did slow me down on finding their matches. There is no story besides what the images themselves tell. Once you start playing the first level, you are forced to go through a tutorial by clicking the tiles that the arrows are pointing to. You can not click anywhere else but where the arrows point. I have not seen a button to turn off the tutorial but it is possible that I just missed it. For each board the goals for each level are first shown to you in the center of the screen & once the board is started then they are shown at the top of the screen. Starting at the upper left is an arrow taking you back to the main screen, then came a box with the number of gold tiles to be found, number of moves you have used on that board, then the timer for that board & finally the points/ money you have won. 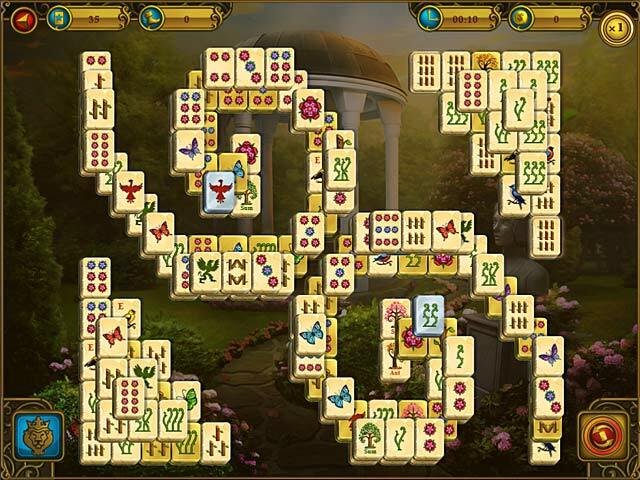 At the bottom of the screen, the lower left has a gold lion on a blue back ground that highlights the available tiles & the lower right has a symbol that means to shuffle the tiles. When you run out of possible moves a text box automatically pops up for an OK to shuffle the remaining tiles. Once you have matched the final gold tile the game stops & gives you your score. You can then either choose to replay the level by clicking the picture of that board layout again or choose the next board that would now be unlocked & lit up. If you would rather clear all tiles from the board then it would be important to remember to leave at least 1 gold tile un matched so you could continue to match the reg white tiles until they are all matched then complete the game by going back & matching that final gold tile. Again this would be much easier if the player could choose which way they like to play Mahjong, instead of trying to work around the way this one plays. You are permitted to match gold tiles w/ white tiles, only part that needs to match are the symbols. They even allow a kings crown to match w/ a queens crown but does NOT allow the North, East, South & West coins to match the others. Flowers to flowers yes...just determine if the rules are the same as you have generally played in the past & check the help section if you need more help. I am sure there is more info than this, to this game. When you start the game you have FPS-60 and UPS 3000 & I do not know what these refer to. After you choose Play on the first screen, you are then on the 2nd screen. They have listed Contest, Trophies, Options & Help..I am unclear on if there is more to the "Contest" as no real details have been given. Take a look at the center picture shown as each of these is the background for the boards you would play for each field. If this sounds like a game you might enjoy give the demo a try. For me I enjoyed my demo though I was having a very difficult time getting all 3 stars, but my choice of tiles was also effecting my speed as I was trying tile designs that looked nothing like the tiles I generally use to play mahjong with. I recommend this game if you have demo'd it to try it for yourself. Rated 4 out of 5 by Imberis from Good Mahjong Fun I found myself liking this game. The story is a little vague, but whatever. Pros: -Smooth gameplay. -Artwork is nice and bright. -Mahjong tiles can be changed to whichever set you like. They all have generally the same theme, but some have roman numerals instead of "regular" numbers, so you can change that. -Ability to shuffle tiles when needed. -Ability to highlight just the active tiles, if you need that. -Objectives to achieve in each level, e.g., get X amount of gold, complete the round in less than X amount of time, etc. -Levels are replayable to get all of the achievements. -There are trophies, but they don't look too difficult to get. Cons: -Story could be more interesting and/or explained. -More achievements where you actually need to work at the game to get them would be nice. All in all, this is a nice mahjong game. Nothing too out of the ordinary, but it seems nice to play when you need a break from other games. Rated 3 out of 5 by CharlesR57 from A fairly good game This was a fairly good game. Lots of levels. The downside was getting out of the game. It is so confusing I would have bought the game, except for this one thing. Rated 3 out of 5 by Rebr2009 from Decent game. Not the best but not the worst mahjong. 6 challenging levels (20 steps each). You will play classic mahjong and also will try to accomplish goals (number of movements, number of golden tiles, and time). You can choose between 6 types of tiles that are colorful and well designed. Has hint (enlightening free tiles) and shuffle button (which completely fills when you take the silver tiles). A good game for rainy days. Rated 3 out of 5 by whogirl from meh I love mah jong games. But not this one. The music is real irritating when you start, it becomes just annoying while you play. You can't turn off the tutorial so you end up having to follow directions for the first game. Can we say annoying boys and girls? Mah Jong has been around for a while now, most of us know how to play, so let those of us who do be able to turn off the tutorial if we don't need it. I did rather like using roman numerals. Easyer to see. I don't usually like timed games, but this one didn't matter because you can move to the next level anyway. In fact the only thing you had to do was clear the board. So it could be as challenging as you want it to be. Was there a storyline? I saw some guy fly in on a magic carpet and destroy things, I don't know what that was all about. I'm not buying this one. It's a seen one seen them all, sort of game. I think I'll go play Mah Jong Quest or kyodi.